Alison Steadman and Ruthie Henshall star in Noel Coward's prefect comedy Blithe Spirit. Save £16.50 on tickets. Featuring an all-star cast including Alison Steadman (Gavin & Stacey) as Madame Arcati, Ruthie Henshall (Crazy for You) as Elvira, Hermione Norris (Spooks) as Ruth and Robert Bathurst (Cold Feet) as Charles Condomine. Featuring an all-star cast including Alison Steadman (Gavin & Stacey) as Madame Arcati, Ruthie Henshall (Crazy for You) as Elvira, Hermione Norris (Spooks) as Ruth and Robert Bathurst (Cold Feet) as Charles Condomine. Enjoy a special offer on the sparkling new West End revival of Noel Coward’s classic comedy Blithe Spirit, at the Apollo Theatre in London. In the play, the novelist Charles Condomine (Bathurst) and his second wife Ruth (Norris) are haunted when an eccentric medium (Steadman) manages to conjure up the ghost of Charles’s neurotic and beautiful first wife, Elvira (Henshall), at a séance. 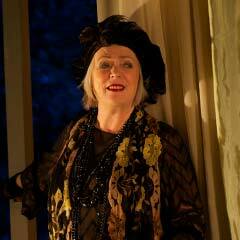 Noel Coward’s witty comedy is directed by Thea Sharrock (Cause Celebre, After The Dance).